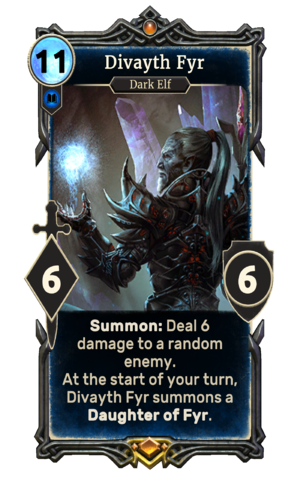 Divayth Fyr is a unique legendary Intelligence creature card. It is part of the Core Set. If Divayth Fyr's effect remains active for more than four turns, he will begin the sequence again with Alfe Fyr. "I can't waste energy talking to boring people." "This will end in blood!" Summoning Daughters of Fyr contributes towards the The Clonemaster title. Divayth Fyr, along with his daughters, first appeared in Morrowind and later appeared in ESO. For more information, see the lore article.